Final assembly work on our first PC-24 customer aircraft is proceeding at a swift pace: the fuselage and wings of the first series-built PC-24 were joined together at the head office site on 12 July 2017. 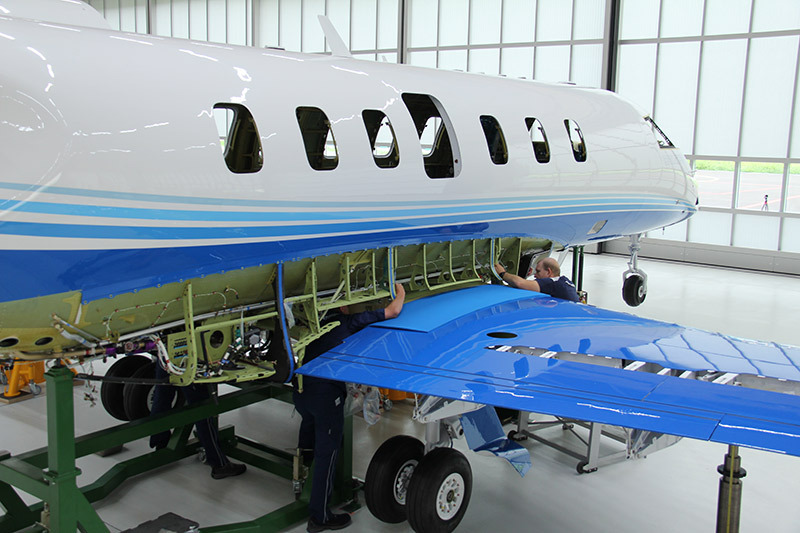 Series production is being accelerated continuously to ensure that prompt deliveries of first customer aircraft can go ahead immediately after certification. This operation, referred to as a “marriage”, requires the highest degree of concentration from the Pilatus builders. The process of attaching the wings to the fuselage demands accuracy to within a hundredth of a millimeter. Not to mention that the connection has to be solid enough to last for a “business jet lifetime”. This extremely important stage sees our technicians join the 16.8 metre fuselage to the wings, spanning 17 metres. The “marriage” is followed by the cabin installation and commissioning and testing of the aircraft systems. This entry was posted on Wednesday, July 12th, 2017 at 11:56 am. Both comments and pings are currently closed.